Oyedo opens as a juicy, fruity orange mingling with a juicy lemon. There’s definitely something cool and mentholated in this that reminds me of a cough drop. I don’t know if it is psychosomatic or what, but I swear it’s so mentholated, that I *can feel* the coolness on my skin. I can’t really explain to you why I like something that smells like citrus on uppers and also like something you’d buy in the “Cold & Flu” aisle of your drugstore, but I do. 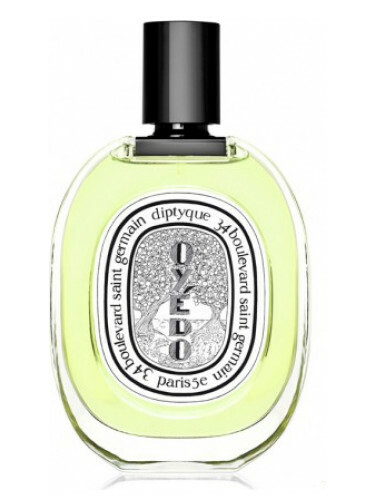 I think Oyédo is a great fragrance, especially in the summer. It cuts through muggy air with the ease of a knife being sold on an infomercial that is giving me the hard sell and I AM BUYING IT. The dry-down is weird and herbal. The citrus are dialed down and there’s something that smells like moss growing on stones (mineral, green, cool and damp). If I had to choose one word to describe Oyedo, I wouldn’t go for a word but more of an onomatopoeia: ZING! It’s a zesty, energetic fragrance that zooms on by. I also think of it as a lemon in a snowbank. When it’s hot like this, it’s the sort of thing I want to wear. It’s a real pick-me-up. Notes listed include lime, mandarin orange, lemon, yuzu, thyme and woods. Launched in 2000. Give Oyedo a try if you like citrus or yuzu scents. Or perfumes like Smell Bent Tok’yo Mama (or the flanker Fizzzz), Heeley Note de Yuzu, Tom Ford Mandarino di Amalfi, Lili Bermuda Fresh Water and/or Fresh Sugar Lemon. It’s very much a citrus-centric fragrance so it wears more like a “cologne”. It is an EDT. I think projection and longevity is average for an EDT but it doesn’t last as long as others from the brand (such as Eau Duelle). Oyédo comes in a few sizes with the 1.7 oz retails for $95 at Nordstrom and Saks. Victoria’s Final EauPINION – Mentholated citrus. It’s sort of like a Jakeman’s cough drop but so much more juicier. Lemons in snow. It’s what I want when it’s hot and muggy. *Sample obtained by me. Product pic from the brand. Esther Williams pic from retrogirly.tumblr.com. Post contains affiliate links. Thanks!